When we get new tech gadgets, like an Amazon Echo or the newly released iPhone, the possibilities for how they can enhance our productivity becomes almost overwhelming. When there are one million apps that lead you through guided meditations, another hundred music streaming options with fitness workout playlists, and LTE connectivity capabilities and GPS tracking, it can tend to lead to option paralysis. 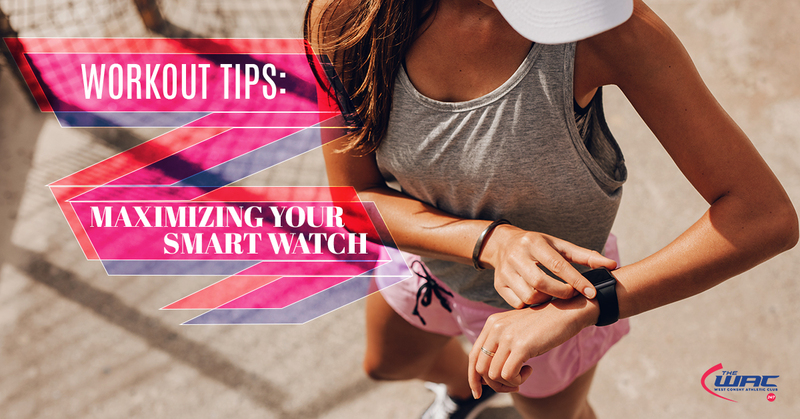 At West Conshy Athletic Club, our 24-hour gym, we have noticed that many of our clients wear smartwatches, but not all of them optimize their smartwatch for fitness performance. We know the capability that these gadgets can have to boost your fitness and overall health routine, so we wanted to share suggestions that’ll make your smartwatch worth the money and your fitness routine better than ever. The Apple Watch has thousands of applications to download, but we think WaterMinder might be the best of them all for health-conscious people. We all hear how important proper hydration is for general health, and this is especially true for people who workout. You must be hydrated so that your body functions at the cellular level. WaterMinder tracks your water intake and reminds you to drink water depending on time and how much you have already consumed. If you find yourself at the gym feeling totally depleted, chances are you’re dehydrated. Give your body something to sweat out by downloading WaterMinder. In addition to downloadable applications, the Apple Watch also comes with the Activity app as part of its dashboard. This app, as you know if you have a smart watch, tracks your movement, exercise, and standing goals. You might be enthralled by this fitness tracker for the first few weeks you have your smartwatch, but then it can tend to get old. The trick here is to share your Activity app with friends, so that you can see their rings and they can see yours. Simply by sharing your fitness tracking data, you unleash the most primal human force there is: competition. Now, you have a layer of accountability and it’s always more fun to work toward fitness goals with friends. West Conshy Athletic Club believes in the power of group fitness to motivate individuals and build community, which is why we have group fitness classes at our 24-hour gym. If you are motivated by sharing your Activity circles with friends, imagine the power of working out with other fitness-minded individuals. Strava is also one of the original smartwatch apps that taps into competition as the ultimate incentive. With this fitness app, you can track workout metrics such as time and distance, and also compare your fitness session to your friends’ and people nearby. Consider this app or at least share your Activity fitness rings with friends, so that you have a layer of accountability and support when it comes to working out! If you were to ask any of our fitness trainers about how they developed the health routine they have today, chances are they would say having a fitness plan every day at the gym. Instead of just getting to the gym and deciding what you feel like doing there, it is more effective to have a planned fitness routine with exercises that target specific muscle groups. Streaks helps with this fitness planning because you can choose a workout type, set the duration and difficulty of the workout, and then it will tell you the number of reps you should complete. The downfall of Streaks it that you cannot access the exercise demonstrations on your smartwatch. However, you can always speak with one of our personal fitness trainers to make sure you are performing exercises safely and using fitness equipment correctly. At West Conshy Athletic Club, we are always looking for ways to help our clients develop, work toward, and ultimately meet their fitness goals. While our fitness blog offers tips and recommendations, there is nothing like having an in-person fitness community to support you and your workout routine. Come into our 24-hour gym in West Conshohocken at any time to meet our knowledgeable and helpful staff and gain a great fitness community today.